Summer is just around the corner and if you are lucky enough to be jetting off somewhere gloriously hot this month you’ll probably already be thinking about swimwear. There’s so much choice out there, but one trend I have spotted that sums up summer for me is the crochet trimmed bikini. With its colourful and fun edging this style oozes holiday vibes. I started by cutting off the ties on the bottoms but not the top. 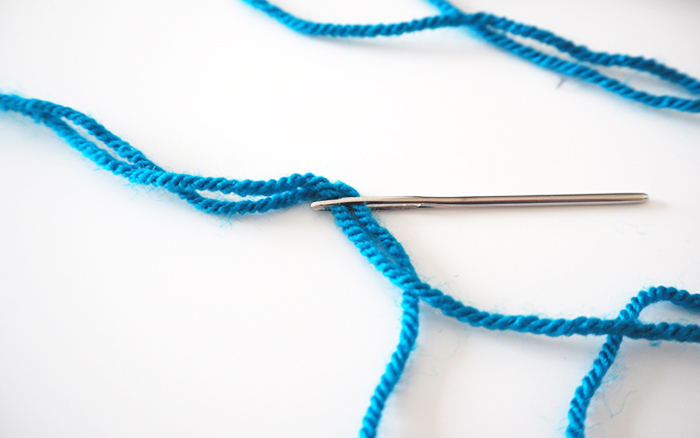 Start by folding a length of thread in half and threading it through the needle so you have two strands of yarn and a loop at one end. Next cut a small hole in the top left corner of the bikini bottoms right under the seam or stitching. 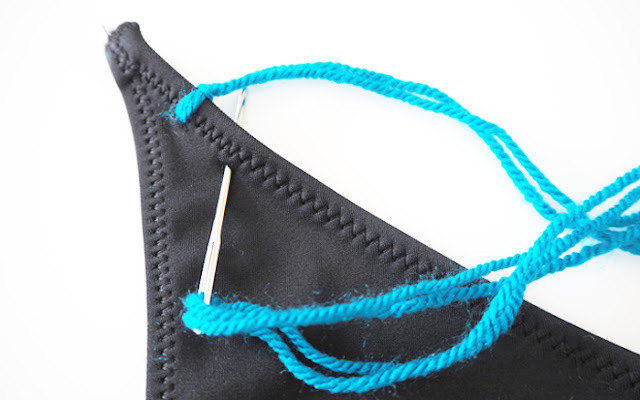 Pass your needle through the cut from the back to the front pulling the thread half way through. 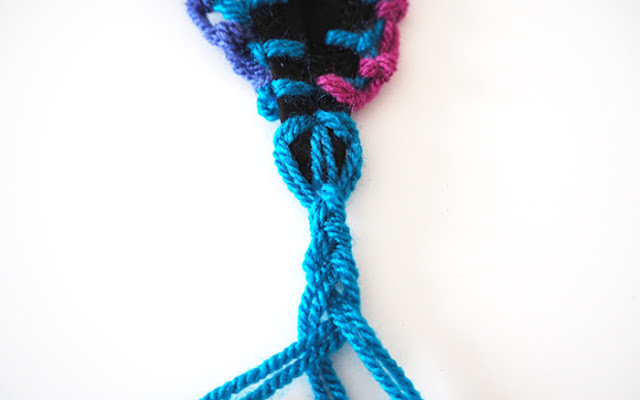 Then pass the needle through the loop at the end of the yarn and pull to create your first stitch. It should look a little like a T shape. 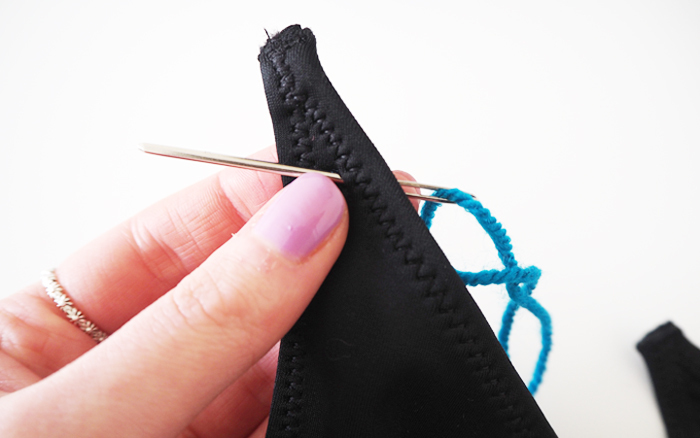 To create a second stitch, cut another hole about 1cm away from the first and pass the needle through again. 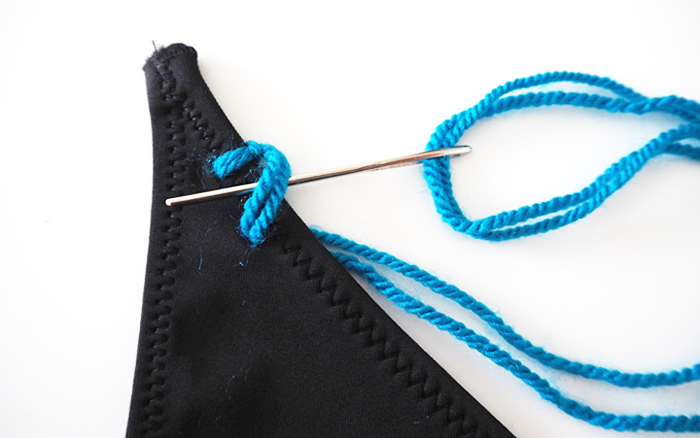 Pull the thread almost all the way through before catching the loop and passing the needle through the back to create another stitch like below. 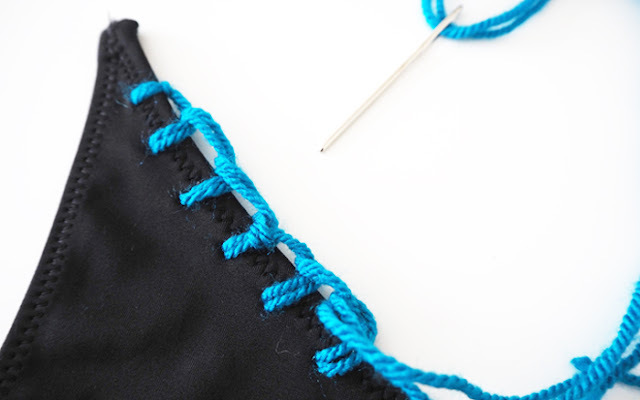 Continue on until you have a row of stitching right across the top. Do the same for each side of the bikini. 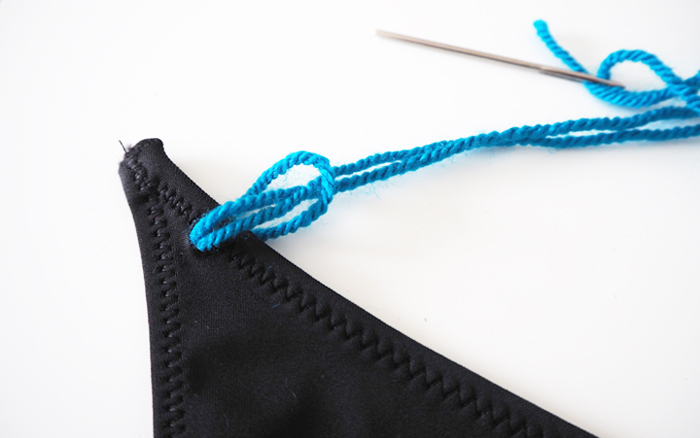 Next you can add another layer of stitching in a different colour using the same stitch action but instead of passing the needle through a cut in the bikini, pass it through the top of the stitch below. Continue on until you are happy with the colours and filled all the edges of you bikini. I repeated the same process for the top but left the ties around the back then added a little coloured tassel at the front. 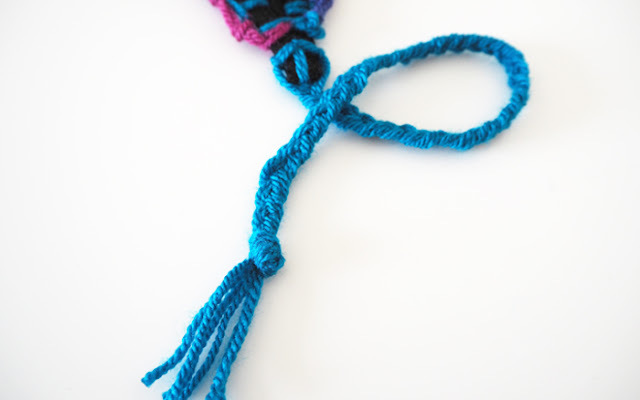 You can use as many colours as you like and add things like beads or charms for extra festival chic. I love the fact that a simple black bikini can be revamped to look unique and expensive without the spending too much. My bikini cost £6 all together and I had spare balls of wool from another project already in the house. Try using ribbon or embroidery threads if you don’t have any spare yarns, anything goes! 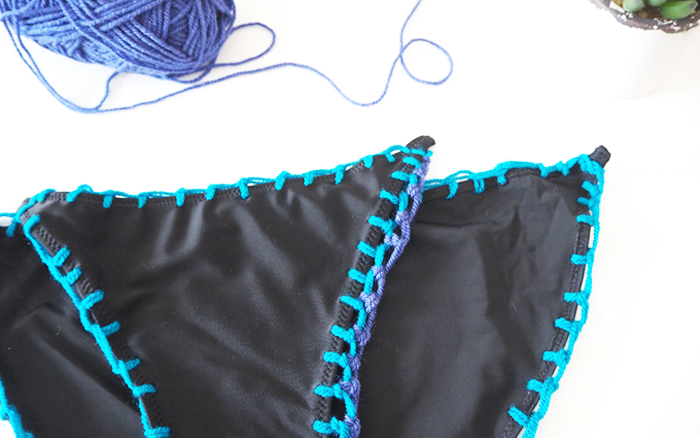 So whether you are dreaming of the beach or just fancy jazzing up some plain swimwear, follow my easy guide to a customised crochet trim bikini to brighten up your summer. The best bit is you wont see anyone else wearing the same bikini on the beach! What are you making this summer? Comment below! I hope you found this little tutorial useful, I would love to hear your comments and thoughts! Follow Anna ‘s board | Boho style | on Pinterest.